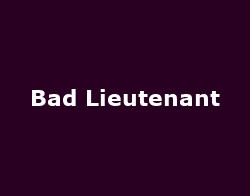 Bernard Sumner's Bad Lieutenant project took off in 2009 to a welcome response (for the most part) - their initial live appearances (and with Pet Shop Boys) were well received and the all-important fruits of their hard recording-labour were juicy enough on the album, 'Never Cry Another Tear'. Thankfully the interest isn't likely to wane with the announcement of some UK appearances and a new single, as well as some Stateside activity you might like to know about. The gigs kick off on March 15th at the Sheffield Leadmill followed by newly on-sale nights in Glasgow and London (Camden Ballroom) as well as Preston and finally Liverpool on the 21st. Ticket prices are around the £22 mark depending on venue and are on sale now. In addition to the UK dates, Bad Lieutenant have rescheduled their cancelled US shows in Chicago and New York as well as tacking on two California dates, including a Coachella Festival appearance - these are all in April (Check their website for details). In line with the US dates, two more singles are to be released in both territories. On iTunes, a remix of the stonking single 'Sink Or Swim' gets unleashed on Feb 15th (16th in US), coupled with a further remix of 'Dynamo' (the original B-side choice last year). The next full UK single will be the equally-excellent 'Twist Of Fate' on March 22nd, also from the album (full b-side details to be announced).